Library Lovers' Month is a month-long celebration of libraries of all types. This is a time for everyone, to shout out how their favorite library contributes to study, work, and leisure. 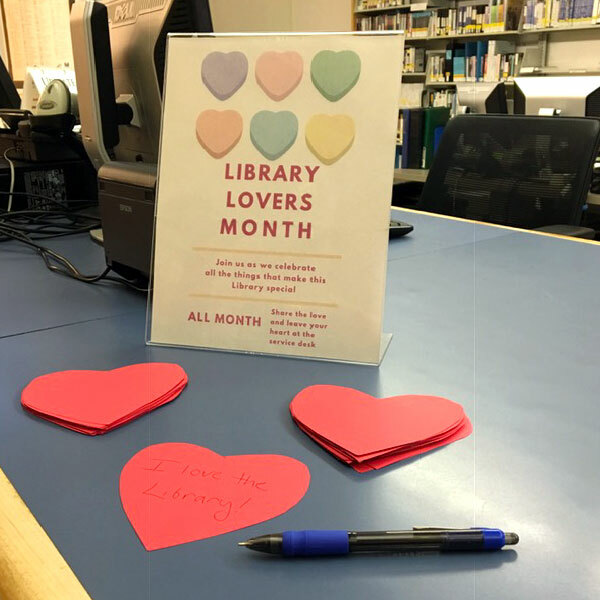 To help our customers celebrate the Health Sciences Library, we have red hearts available at the Library Service Desk where you can write your words of appreciation and post them! According to Days Of The Year, which has been documenting international holidays since 2009, February is Library Lovers Month. It makes sense, Valentine's Day is mid-month, so people are already primed to celebrate love in all its forms. Why not extend those feelings to an institution that Pew Research Center says is favorable to 77% of U.S. adults? Last Modified: February 05, 2019. Contact Devin Kerr with questions about the content of this page.